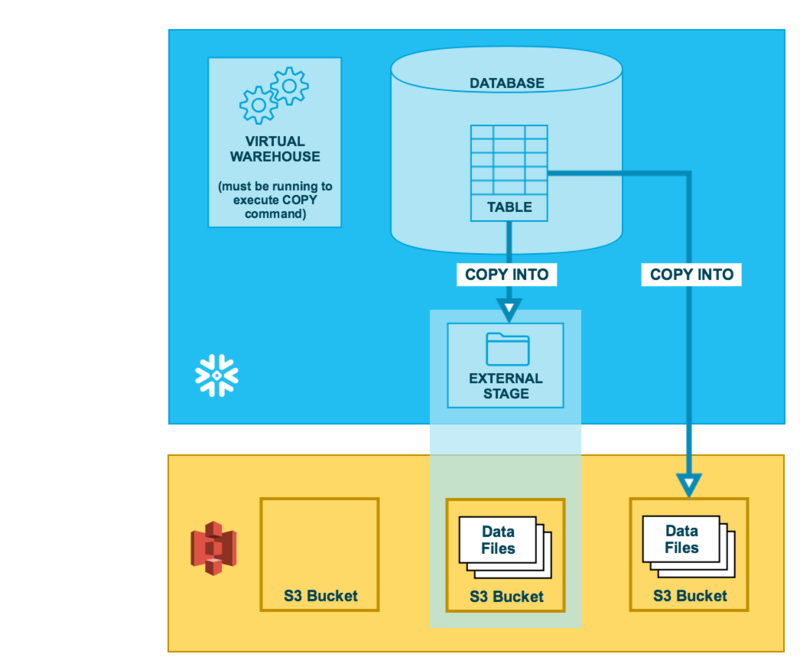 If you already have a Amazon Web Services (AWS) account and use S3 buckets for storing and managing your data files, you can make use of your existing buckets and folder paths when unloading data from Snowflake tables. This topic describes how to use the COPY command to unload data from a table into an Amazon S3 bucket. You can then download the unloaded data files to your local file system. Use the COPY INTO <location> command to copy the data from the Snowflake database table into one or more files in an S3 bucket. In the command, you specify a named external stage object that references the S3 bucket (recommended) or you can choose to unload directly to the bucket by specifying the URI and security credentials (if required) for the bucket. Use the interfaces/tools provided by Amazon to download the files from the S3 bucket. As a best practice, Snowflake recommends creating an Identity & Access Management (IAM) policy and user for Snowflake access to the S3 bucket. You can then attach the policy to the user and use the security credentials generated by AWS for the user to access files in the bucket. For configuration instructions, see Configuring IAM Credentials to Access an External Stage. Note that the AWS_KEY_ID and AWS_SECRET_KEY values used in this example are for illustration purposes only. Use the COPY INTO <location> command to unload data from a table into an S3 bucket using the external stage. Use the S3 console (or equivalent client application) to retrieve the objects (i.e. files generated by the command) from the bucket. Use the COPY INTO <location> command to unload data from a table directly into a specified S3 bucket. This option works well for ad hoc unloading, when you aren’t planning regular data unloading with the same table and bucket parameters. You must specify the URI for the S3 bucket and the security credentials for accessing the bucket in the COPY command. This example uses temporary S3 credentials, which are generated by AWS STS and expire after a specific period of time. When unloading directly into an S3 bucket, Snowflake recommends using temporary credentials to protect access to the bucket.